Zheng, H., Tian, H., Shen, Y., Wang, J., Zhao, S. (2018). Conceptual Design of n-Butyl Acetate Synthesis Process by Reactive Distillation Using Residue Curve Maps. Iranian Journal of Chemistry and Chemical Engineering (IJCCE), 37(3), 107-115. Huidong Zheng; Hui Tian; Yanyi Shen; Jie Wang; Suying Zhao. "Conceptual Design of n-Butyl Acetate Synthesis Process by Reactive Distillation Using Residue Curve Maps". 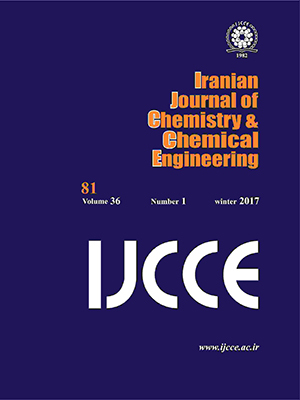 Iranian Journal of Chemistry and Chemical Engineering (IJCCE), 37, 3, 2018, 107-115. Zheng, H., Tian, H., Shen, Y., Wang, J., Zhao, S. (2018). 'Conceptual Design of n-Butyl Acetate Synthesis Process by Reactive Distillation Using Residue Curve Maps', Iranian Journal of Chemistry and Chemical Engineering (IJCCE), 37(3), pp. 107-115. Zheng, H., Tian, H., Shen, Y., Wang, J., Zhao, S. Conceptual Design of n-Butyl Acetate Synthesis Process by Reactive Distillation Using Residue Curve Maps. Iranian Journal of Chemistry and Chemical Engineering (IJCCE), 2018; 37(3): 107-115. Residue curve maps are a powerful tool for the preliminary design of Reactive Distillation (RD). In this study, residue curve maps of the n-butyl acetate synthesis reaction were calculated based on the Langmuir–Hinshelwood–Hougen–Watson kinetic and UNIQUAC models to calculate the physical properties of the system. The results showed that the unstable node branch emerged from the n-butyl acetate/water edge, moved toward the chemical equilibrium surface with increasing Damköhler number, and no ternary reactive azeotropic point appeared when the reaction was added. Conceptual design of n-butyl acetate synthesis by reactive distillation based on residue curve maps is presented. Based on the simulation results, both the energy consumption and the total annual cost were lower than previously reported values. Li C.S., Daisuke H., Suzuki K., N-butyl Acetate Synthesis Via Reactive Distillation: Thermodynamic, Process Design, Computers & Applied Chemistry, 1124: 1585-1589 (2009). Liao A.P., Tong Z.F., Synthesis of Butyl Acetate Catalyzed by Amberlyst, Chemical Reaction Engineering & Technology, 11: 406-408 (1995). Arpornwichanop A., Koomsup K., Assabumrungrat S., Hybrid Reactive Distillation Systems for n-butyl Acetate Production from Dilute Acetic Acid, Journal of Industrial & Engineering Chemistry, 14: 796-803 (2008). Hanika J., Kolena J., Smejkal Q., Butyl Acetate via Reactive Distillation: Modelling and Experiment, Chemical Engineering Science, 54: 5483-5490 (1999). Steinigeweg S., Gmehling J., n-Butyl Acetate Synthesis Via Reactive Distillation: Thermodynamic Aspects, Reaction Kinetics, Pilot-Plant Experiments, and Simulation Studies, Industrial & Engineering Chemistry Research, 41: 5483-5490 (2002). Gangadwala J., Radulescu G., Kienle A., Sundmacher K., Computer Aided Design of Reactive Distillation Processes for the Treatment of Waste Waters Polluted with Acetic Acid, Computers & Chemical Engineering, 31: 1535-1547 (2007). Jimenex L., Costa-Lopez J., The Production of Butyl Acetate and Methanol Via Reactive and Extractive Distillation. II Process Modeling, Dynamic Simulation, and Control Strategy, Industrial & Engineering Chemistry Research, 41: 6735-6744 (2002). Jimenez L., Wanhschafft Q.M., Julka V., Analysis of Residue Curve Maps of Reactive and Extractive Distillation Units, Computers & Chemical Engineering, 25: 635-642 (2001). Marcelino C.R., Juan G.S.H., Adrian B.P., A Short Method to Calculate Residue Curve Maps in Multireactive and Multicomponent Systems, Industrial & Engineering Chemistry Research, 50: 2157-2166 (2011). Peters M., Kauchali S., Hildebrandt D., Glasser D., Application of Membrane Residue Curve Maps to Batch and Continuous Processes, Industrial & Engineering Chemistry Research, 47: 2361-2376 (2008). Huang Y.S., Kai S., Schlünder E.U., Theoretical and Experimental Study on Residue Curve Maps of Propyl Acetate Synthesis Reaction, Chemical Engineering Science, 60: 3363-3371 (2005). Sánchez-Daza O., Escobar G.V., Zárate E.M., Muñoz E.O., Reactive Residue Curve Maps a New Study Case, Chemical Engineering Journal, 117: 123-129 (2006). Almeida-Rivera C.P., Swinkels P.L.J., Grievink J., Designing Reactive Distillation Processes: Present and Future, Computers & Chemical Engineering, 28: 1997-2020 (2004). Duarteet C., Loureiro J.M., Effect of Adsorption on Residue Curve Maps for Heterogeneous Catalytic Distillation Systems, Industrial & Engineering Chemistry Research, 43: 3242-3250 (2004). Zheng H.D., Tian H., Zou W.H., Huang Z.X., Residue Curve Maps of n-butyl Acetate Synthesis Reaction, Journal of Central South University of Technology, 20: 50-56 (2013). Wang X.D., Wang Q.L., Ye C.S., Dong X.L., Qiu T., Feasibility Study of Reactive Distillation for the Production of Propylene Glycol Monomethyl Ether Acetate Through Transesterification, Industrial & Engineering Chemistry Research, 56: 7149-7159 (2017). José S.L.V., Izabela D.G., Miguel Á.G.G., Vapour-Liquid Equilibrium and Distillation Scheme for the Hydrochloric Acid-Ethanol-Water Ternary Mixture, Canadian Journal of Chemical Engineering, 94: 2380-2385 (2016). You X.Q., Gu J.L., Peng C.J., Shen W.F., Liu H.L., Improved Design and Optimization for Separating Azeotropes with Heavy Component as Distillate through Energy-Saving Extractive Distillation by Varying Pressure, Industrial & Engineering Chemistry Research, 56: 9156-9166 (2017). Thakur S.S., Ojasvi Kumar V., Kaistha N., Continuous Diisobutylene Manufacturing: Conceptual Process Design and Plantwide Control, Computers & Chemical Engineering, 97: 59-75 (2017). Dacruz F.E., Manousiouthakis V.I., Process Intensification of Reactive Separator Networks Through the IDEAS Conceptual Framework, Computers & Chemical Engineering, 105: 39-55 (2017). Sorbier L., Bazer-Bachi F., Moreaud M., Moizan-Basle V., Mean Penetration Depth of Metals in Hydrodemetallation Catalysts, Chemical Engineering Science, 155: 186-193 (2016). Mizzi B., Meyer M., Prat L., Augier F., Leinekugel-Le-Cocq D., General Design Methodology for Reactive Liquid-Liquid Extraction: Application to Dicarboxylic Acid Recovery in Fermentation Broth, Chemical Engineering and Processing, 113: 20-34 (2017). Qiu T., Huang Z.X., Cheng C.B., Wu Y.X., Kinetics of Synthesis n-butyl Acetate over Cation-Exchange Resin Catalyst, Chemical Reaction Engineering & Technology, 25: 355-359 (2009). Elan G., “Aspen Plus User Guide, Version 10.2.California, Aspen Technology (1998). Cheng N.L., “Handbook of Solvents”, Chemical Industry, Beijing (2007). Lee H.Y., Huang H.P., Chien I.L., Control of Reactive Distillation Process for Production of Ethyl Acetate, Journal of Process Control, 17: 363-377 (2007). Zheng H.D., Lin M.M., Qiu T., Shen Y.Y., Tian H.; Zhao S.Y., Simulation Study of Direct Hydration of Cyclohexene to Cyclohexanol Using Isophorone as Cosolvent, Chemical Engineering Research & Design, 117: 346-354 (2017). Xu Y., Ng F.T.T., Rempel G.L., Comparison of a Pseudo-homogeneous Nonequilibrium Dynamic Model and a Three-phase Nonequilibrium Dynamic Model for Catalytic Distillation, Industrial & Engineering Chemistry Research, 44: 6171-6180 (2005). Tian H., Zheng H.D., Huang ZH.X., Qiu T., Wu Y.X., Novel Procedure for co-Production of Ethyl Acetate and n-Butyl Acetate by Reactive Distillation, Industrial & Engineering Chemistry Research, 51: 5535-5541 (2012).